mmmm I love bi bim bap! I am so sorry to hear about miscarriage #2. Thinking good thoughts and sending them your way. Thank goodness for knitting food and movies. Take care of yourself. Hugs. The scarf looks really good. So sorry to hear about your miscarriage. You're in my thoughts and prayers. 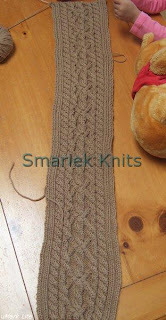 Your scarf looks great...you are a fast cabler ...not sure if that's a word. So sorry about your MC...lots of hugs for you...take good care of yourself! !